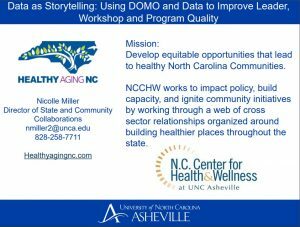 Welcome to our Healthy Aging NC Resource Center series of webinars. Description: Ellen Schneider presentation to NC Falls Prevention Coalition on NCOA Falls Prevention Awareness Day and Week resources available for North Carolina. 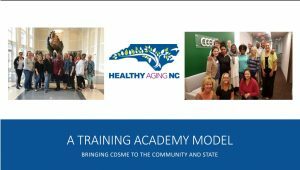 Description: Healthy Aging NC has updated the data forms for A Matter of Balance and Tai Chi for Arthritis in North Carolina. This video provides information on where to find the forms and how to collect and submit them. 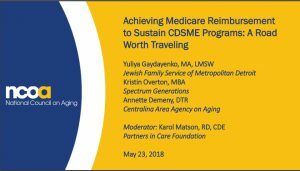 Title: “Road to Diabetes Self-Management Education and Support (DSMES) Accreditation: Our Path, Successes and Challenges” and “Achieving Medicare Reimbursement to Sustain CDSME Programs: A Road Worth Traveling”. 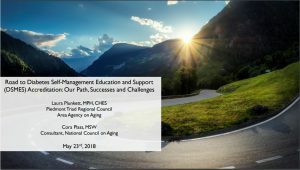 Presenter: Laura Plunkett, Piedmont Triad Area Agency on Aging. Annette Demeny, Centralina Area Agency on Aging. Objectives: An overview of our work, the programs we support, and our website.